From March 4 until late April 2011 Selfridge's five big Wonder Windows on Oxford Street and Orchard St were filled with the work of guerrilla gardeners. GuerrillaGardening.org curated a collection of ingenious yet fundamentally simple weaponry, most were working examples on loan, one was a concept and some were for sale. 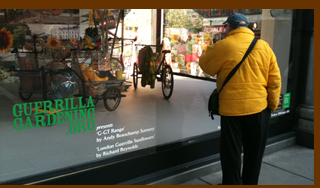 They were presented alongside images of guerrilla grown sunflowers around London that hopefully provoked a few few busy shoppers into finding out more about guerrilla gardening and getting involved. Our windows also did their bit to draw people into Selfridges and shop for gardening related bits and bobs (including some more of our 2010 crop of hand stitched guerrilla London lavender pillows and Kabloom's Seedbom). This temporary garden department was called GROW. You can read more out about the contributors and see the windows in the window below (the scroll bar is at the bottom). Pictures of the windows are also available on Flickr. Download a FAQ about the project here.